Everyone is well aware of Microsoft’s storied historical growth record, which provides a classic case to watch a company progress into the maturation phase. While it is true that the dynamics and capital attention of the business have changed, this does not necessarily rule out the possibility for a reasonable investment. Everyone is keenly aware of the $300+ billion dollar company that is Microsoft (MSFT). From the classic Windows and Office products to the latest Xbox and Skype, the business doesn’t exactly need an introduction. In fact, it’s quite likely that you are using or near a Microsoft product now; we used a couple just to get this article to you. So instead of providing a generic opening, we thought it might be interesting to highlight the company with some numbers. There are 1.3 billion people that use Windows everyday and 1 in 7 of the world’s population use Office. Skype represents one third of the worldwide phone traffic and Outlook has 400 million users. Internet Explorer’s usage share is over 56%. In other words, large is a bit of an understatement. As impressive as these numbers are, it also highlights the limitations of big. For instance, in the beginning a business can quickly increase its foothold from say .00001% of the market share to .00002%. Alternatively, Microsoft would literally be unable to double its Internet usage share. It already has over half the pie, so growth probably has to come from other areas. Trees don’t grow to the sky, or perhaps in Microsoft’s case: trees don’t grow to the stars. With that, we thought it might be interesting to view Microsoft in a slightly different manner from which we are accustomed. 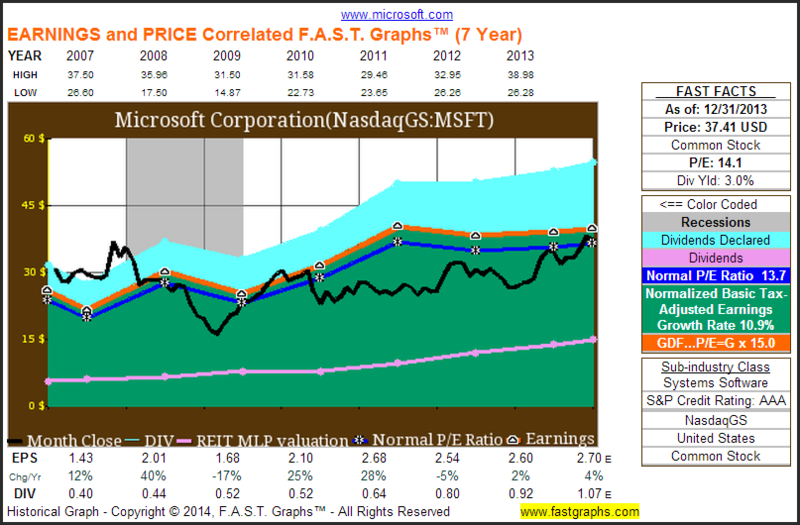 Being acutely aware of the phenomenal stock and business performance of the company over the last three decades – along with the general concept that the superior growth is a thing of the past – let’s view Microsoft’s progression using F.A.S.T. Graphs™. When presented with the “default” or “regular” 15-year F.A.S.T. Graph it reveals quite a bit of information: earnings, dividends, the normal market multiple paid, a theoretical valuation, forecasted earnings and the corresponding relationships between those dynamics. Yet what is often overlooked is the idea that the graphs presented on Seeking Alpha are static such that they demonstrate a single time period of observation. For instance, here’s the traditional 15-year default F.A.S.T. Graph, with 13-years of history and 2 forecasted years. This displays a good amount of information. It shows you that Microsoft grew “adjusted” earnings by a compound rate of almost 9% a year, it gives a theoretical and average valuation paid, shows whether or not the recessions had an effect on the business, demonstrates when Microsoft initiated a dividend and how the payout ratio has evolved. Perhaps most importantly, it illustrates the idea that where earnings go price eventually follows. However, as good as this graph is and as quickly as it provides fundamental information about the business, it does have some limitations. For instance, it doesn’t explicitly reveal how the company’s growth rate has changed over time or whether the market has consistently offered a higher or lower valuation for shares. (Although to be sure, both are implicitly observable) Luckily, a F.A.S.T. Graphs’ subscriber has the option of viewing and reviewing a variety of different timeframes. In doing so, the graphs are dynamic such that new calculations are provided for each period viewed. So, in keeping with the slowing growth trend of Microsoft, you might be inclined to view the growth rate during the 1990’s as compared to the last few years. Below we have included an Earnings and Price Correlated graph from 1994 to 2000, using the Review feature. Here we can see that Microsoft did indeed have a staggering growth rate at nearly 43% per annum. Interestingly, despite the large price decline at the end of this period, an investor still would have realized total returns in the magnitude of 36% per year – turning a hypothetical $10,000 investment into $81,000. Note that the company was not paying a dividend during this time. Alternatively, viewing the last 7 full years reveals a different bit of information. Over this period, Microsoft was able to grow earnings by about 11% per year – surely still a solid pace, but a far cry from the blazing 1990’s. Further, notice that Microsoft had begun paying a dividend by this time. Note that the above numbers represent the compound rate dating back to each period. So the very fast growth we saw earlier is averaged out by the slower growth more recently. Still, a couple of percent points per year over long-time periods can really add up. Here we can see that growth has slowed, but is still quite reasonable. 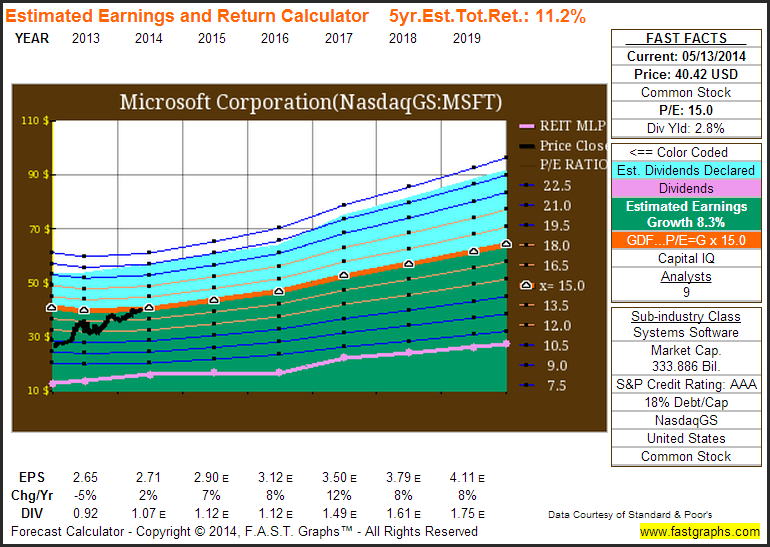 In turn, you can observe Microsoft’s P/E ratio react accordingly to the slower growth. 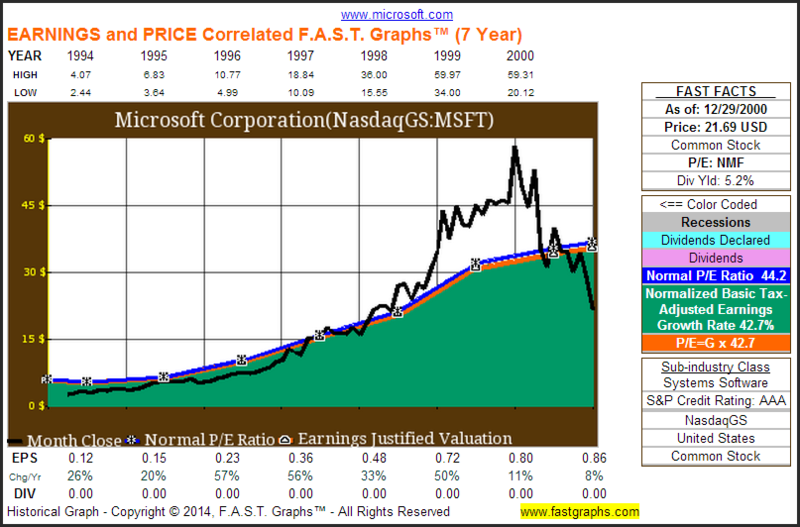 At the turn of the century, Microsoft’s P/E casually resided in the 40’s while today it stands a bit closer to 15. Moving forward you might expect it to remain closer to the latter rather than the former. Interestingly, paying 40 times earnings or 15 times earnings can lead to the same performance results: it’s the underlying business performance that drives this factor in the long-term. Perhaps an even better gauge of a company’s maturation progression is what it elects to do with its earnings. In the early stages companies often reinvest mightily to quickly expand its operations. But eventually there are only so many profitable ventures to take on and companies generally look to return the excess flow to shareholders. This usually takes the form of share repurchases or dividends. To the point of dividends, this has been alluded to somewhat already, but is easily observed in the following performance table. A dividend was initiated in 2003 and has been growing at a healthy pace since then – despite the idea that Microsoft is still paying out well under half of its profits. 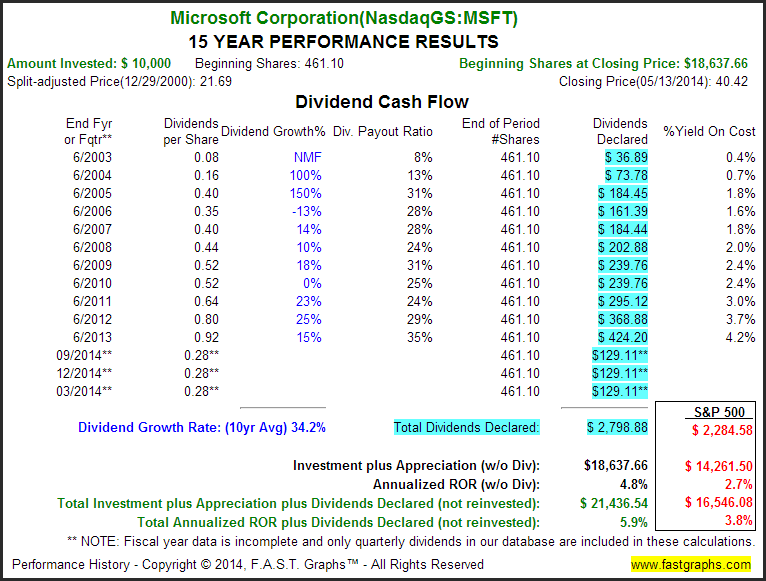 Further, Microsoft started the dividend party off right by offering a $3 special dividend in 2004. Behind the scenes, the share repurchase program has begun to take hold as well. 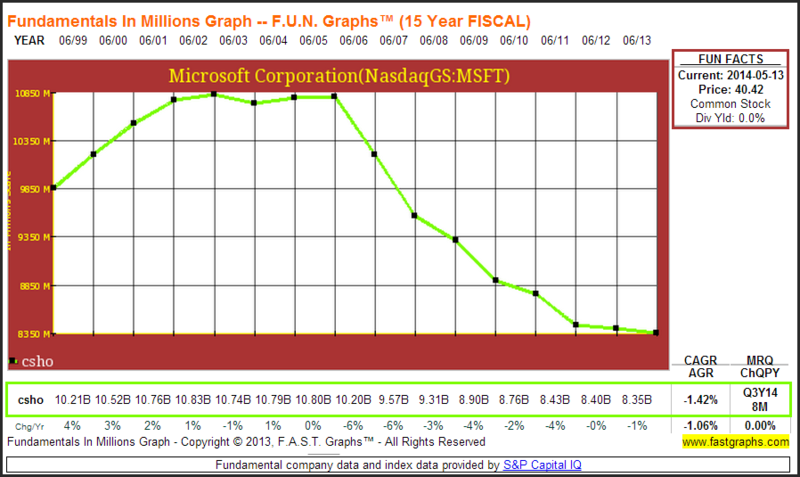 Using the Fundamental Underlying Number (FUN) chart below, we see that Microsoft began substantially reducing share count after 2005. So much so that common shares outstanding have declined by almost 3% per year for the last 8 years. Moving forward, we believe that it is important to keep these concepts in mind. It is apparent that Microsoft likely will not return to its fast growth days of yesteryear. However, the company is expected to grow at a decent pace moving forward. Specifically, analysts come to a consensus long-term earnings per share growth rate estimate of about 8.3% – not unimaginable given room for population growth and new products coupled with a healthy buyback program. If these estimates come to fruition – and Microsoft’s shares trade at a 15 multiple in the future – this would represent an 11.2% annualized return. Now, it’s paramount to underscore the idea that this is simply a calculator, but it does provide a sensible baseline for how analysts are presently viewing this company. In sum, when you look at a standard F.A.S.T. Graph as often depicted on Seeking Alpha by us, or any one of the numerous authors that choose to feature them in their articles, realize that it is a static graph. Granted, this single timeframe provides an enormous amount of information at-a-glance. Yet a user also has the opportunity to view a company in multiple time periods. In the case of Microsoft we found this to be an extraordinary valuable feature. We saw a company move from growing at 40% a year with a P/E in the 40’s to a company growing at 10% a year with a 15 P/E. In both cases an investor’s performance return results were not solely a result of the price-to-earnings ratio paid, but rather by the interaction between earnings growth and price. For the pure total return investor, you would plausibly prefer to find a company in the growth stage rather than the maturation phase. (Swinging for the fence is a lot easier to do if you’re growing at 40% rather than 10%) But keep in mind the idea that you would likely be paying a higher multiple for the chance at higher growth. Today, not many would suggest Microsoft is the high-flying growth choice. After-all, not only is it near impossible to double its share in some segments, but a solid portion of earnings are already earmarked for dividends and share repurchases. Yet this does not preclude the company from reasonable growth. The dynamics of slower growth coupled with a lower valuation multiple mean that this well-established company doesn’t have to knock the cover off the ball for investors to find reasonable returns moving forward. However, as always, we recommend that the reader conduct his or her own thorough due diligence. Disclosure: Long MSFT at the time of writing. 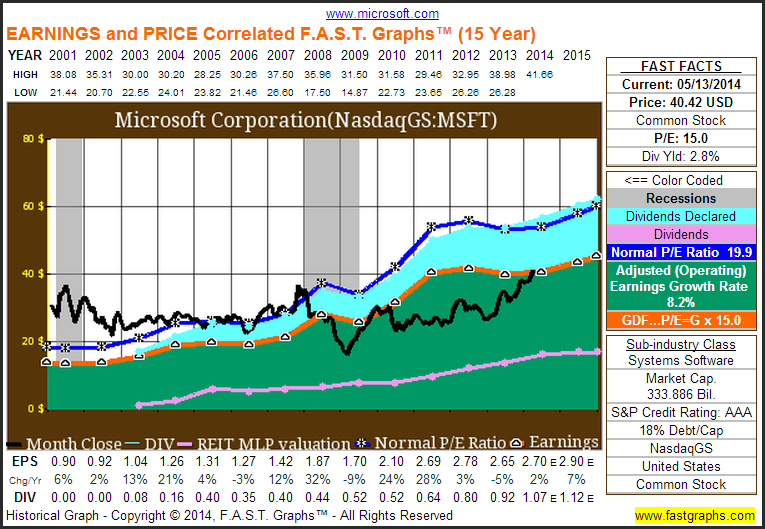 This entry was posted in FAST Graphs At-A-Glance and tagged MSFT. Bookmark the permalink.